Beirut-born and raised Ralph Yirikian has been running VivaCell-MTS, the leading telecommunications operator in Armenia, for over ten years. He came to Armenia on a six-month-long business trip but ended up staying for 14 years and counting. 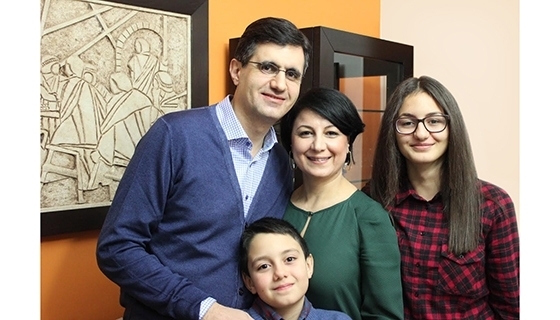 He believes that moving to Armenia is “the best decision” he has made in married life. “I felt quite Armenian over there, but I kept wondering whether I should have felt Armenian or Lebanese. I used to ask my friends: should I be celebrating Lebanon’s Independence Day, or should I focus more on May 28, the Independence Day of the First Armenian Republic?” he says. “My father’s grandparents Haroutiun Yirikian and Siroun Adalian were both born in Adana. They married and had four children: Cesar (who died at young age), my grandfather Martiros, Ludwig and Yeranouhi. Haroutiun was a merchant,” Ralph says. Haroutiun Yirikian and Siroun Adalian with their children (left to right): Yeranouhi, Ludwig and Martiros in Adana, 1906. Adana was located in the south of the Anatolian part of the Ottoman Empire. At the beginning of the 20th century, Adana had a population of some 45,000. Thirteen thousand of its inhabitants were of Armenian descent. There were Armenian churches, schools and kindergartens. A year after the Young Turks seized power, in April of 1909, massacres of Armenians began in the Adana villayet. Some 20,000 people were killed and Armenian villages and city districts were destroyed. The Yirikian family managed to escape to a relatively safe Aleppo. “In Aleppo, Haroutiun had to work as a garbage man to support his family. While performing his duties he got infected with a contagious disease and eventually died. His wife, Siroun, died just three days after Haroutiun. Their children were sent to an orphanage back in their native Adana,” Ralph recalls. Nineteen fifteen marked the start of the Armenian Genocide. Those who were not killed in their towns were deported to the Syrian deserts en masse. Just like thousands of other Armenians, the Yirikian orphans end up in Aleppo, one of the midway stops on the deportation route. In Aleppo, Martiros was found and picked up by one of his great-grandmother’s relatives, but he was desperate to go back and find his siblings. He was taken back to an orphanage, where he found his sister and brother. Sometime later the children were transferred to Lebanon and placed in an Armenian orphanage, where they grew up. Martiros ended up serving in the Eastern Legion (called “Armenian” beginning in 1918) of the French Army. Meanwhile, Ludwig moved to Damascus, lived in an Armenian environment and married an Armenian, forming a family with three sons and a daughter. Yeranouhi got married and lived in Beirut. Martiros eventually settled in the suburbs of Beirut, where there were no Armenians, and married a Lebanese girl. Ralph Yirikian’s grandfather Martiros and grandmother Aniseh. “My grandmother’s name was Aniseh in Arabic. I do not remember her, as she died when I was 11. But I remember my grandfather, who was thin and tall just like me, aged, with a bit of a bent in his back, unable to walk without a cane. He was extremely taciturn. He spoke Armenian with difficulty, not because he didn’t know the language. He certainly knew it, but wouldn’t speak. When his grandchildren – my brothers and I – were talking, I could feel him get delighted, he himself would add a couple of words and then switch to Arabic. I assume that there was some fear, some psychological shock that can’t be overcome till the end of a man’s life,” Ralph remembers. Martiros had three children – Georgette, Siroun and Cesar, Ralph’s father. Martiros Yirikian with his children: Cesar, Siroun and Georgette. “My father grew up in an environment where no Armenian was spoken. Moreover, he married a non-Armenian, but my mother’s contribution to the preservation of our Armenian roots is great,” says Yirikian. Cesar and Emily Yirikian had four children: Pierre, Paul, Mirelle and Ralph. “My mother saw that my father suffered from the fact that he couldn’t speak Armenian, that’s why she did her best to make sure we wouldn’t face the same problem. We could have been sent to an Arabic school, but nevertheless we were sent to an Armenian one,” says Ralph. Cesar and Emily Yirikians’ children: Ralph in the center with his twin brothers and sister. “I was born in Beirut and I am half Lebanese, but the environment I grew up in – the school, the club, the games – was totally Armenian. From kindergarten to the very last grade of school we were infused with dreamlike images of Armenia, Armenian history, geography, the Armenian language,” says Ralph. In 2001 Ralph Yirikian visited Armenia for the first time, having been sent on a business trip to Nagorno-Karabakh by the LibanCell company. “I experienced cultural shock. My brain tried to process what my eyes saw, but I couldn’t do it, I couldn’t reconcile it with what I had learned. We were not taught what communist Armenia was like during the Soviet times,” Ralph recalls. Ralph Yirikian with his wife Armik and their children Sarin and Narek. In 2004 Ralph Yirikian became the chief executive officer of VivaCell-MTS. Under his leadership the company managed to significantly alter Armenia’s telecommunications market. By implementing a number of innovative solutions, the company not only drastically expanded the range of services available to the Armenian customers, but also set an example of corporate social responsibility: throughout the years, the company has heavily invested in the environment, society and culture. “If we want to have a healthy and educated generation in 20 or even in 50 years, we have to create a solid foundation. We should keep our focus on the fields of healthcare, education, environment and culture,” Yirikian believes. Ralph Yirikian has also supported the Armenian Genocide Museum-Institute in the acquisition of valuable documents and artifacts. His efforts over many years have led to a number of items being purchased at international auctions and handed over to the Museum-Institute as evidence of the Genocide. “I do not live with the past, but in order to ensure a peaceful and secure life for our children we need to restore justice today. Every Armenian should consider it a duty to be a part of this cause by paying tribute to our fallen ancestors. It’s a personal responsibility I have to my family,” says Ralph.